There are times in my line of work that I get to travel. 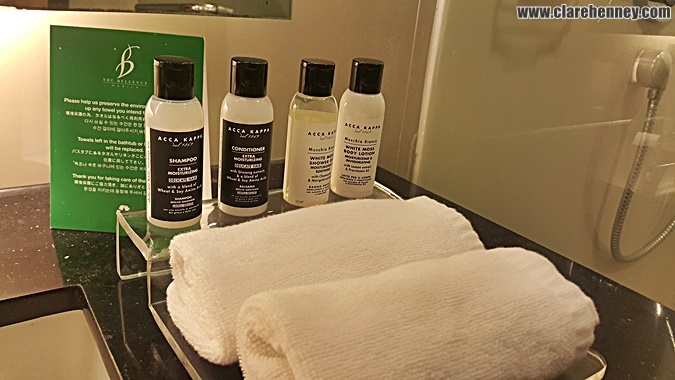 Prior to my trips, I try to find the best deals on hotel rooms, because I usually stay in low-budget hotels as per office policy. I try to make sure that I read hotel reviews before making a booking just so there would be no surprises during my stay. 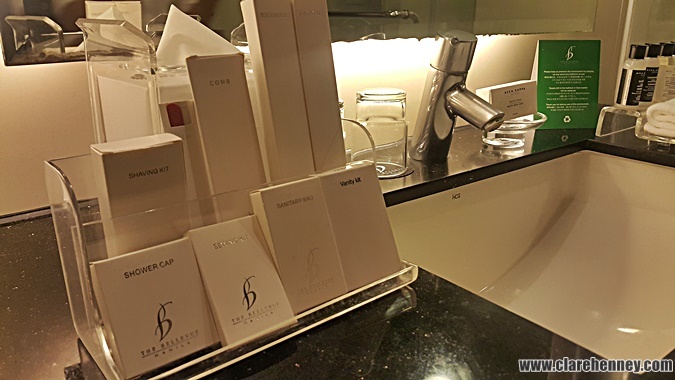 The best hotels, however, are usually off-limits unless there is a need to be at the same hotel where an event is being held, as was the case a couple of years back when I attended a convention at Bellevue Alabang. The previous time I stayed at Bellevue I had stayed at the Main Wing. The room was OK, but it wasn’t anything notable. The second time around we were booked at the Tower Wing and I think the room was much better than the last one that I stayed in. I don’t know how to explain it, but the room at the Tower Wing seemed bigger and more luxurious looking than the previous room I stayed in at the Main Wing. I heard from a friend also staying at the hotel that the Tower Wing was newer than the Main Wing so maybe that was the reason for it. 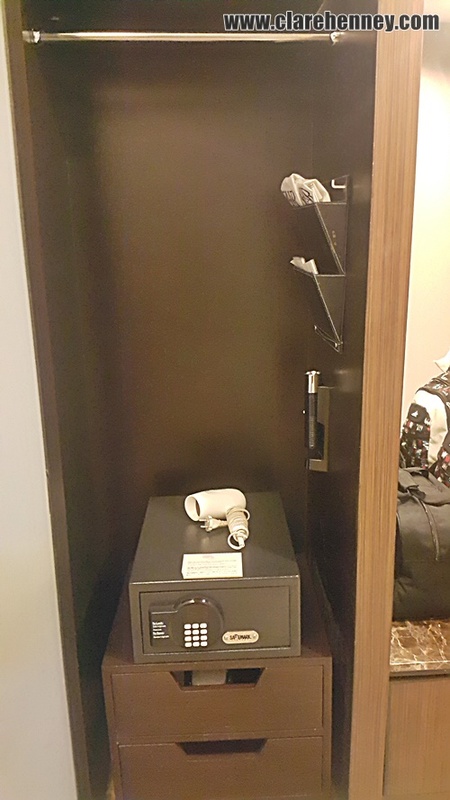 Like most hotel rooms of this class, this room had a mini-ref, provisions for coffee and tea, a safe, an ironing board and hair dryer. 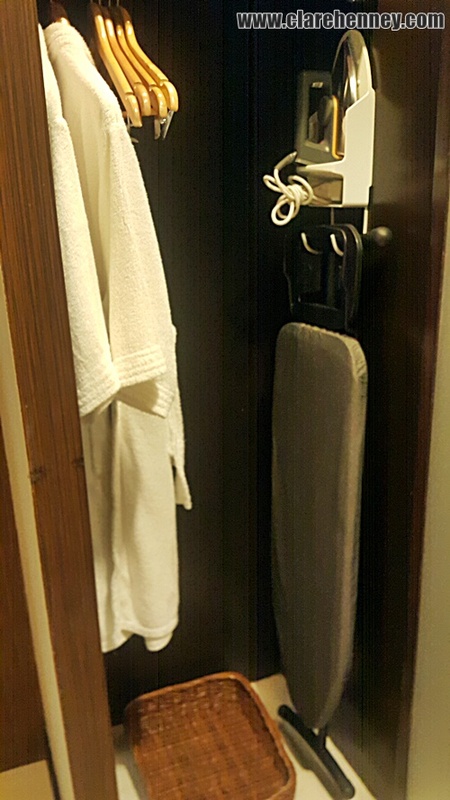 The room had two pairs of slippers, robes, sets of towels and toiletries as well. There was also a welcome fruit bowl and a couple of bottles of water. I loved how spacious the room was. There was enough space for a study/dresser table, coffee table, and a comfortable seat by the side of the room. There was also a large flat TV with enough cable channels to entertain you if you couldn’t fall asleep. Most of my friends know that the big deal for me when choosing a place to stay is a good toilet and bath. It is the deal breaker for me. Luckily, the one in our room did not disappoint. 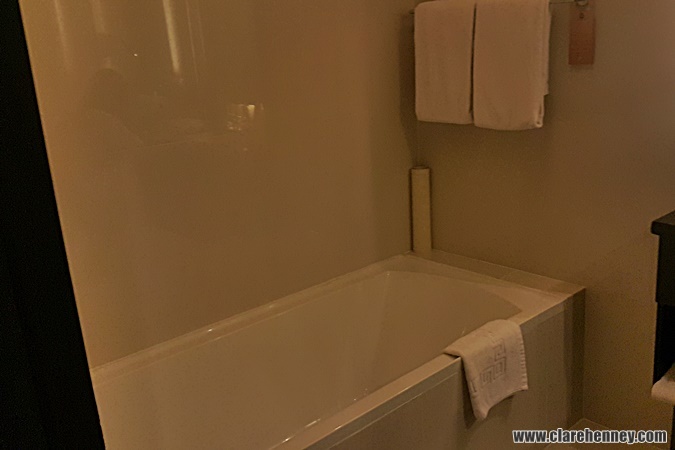 There was a tub, a separate shower, a large sink area and mirror and a clean and relatively new (I think) toilet. I wanted to try the tub when I was there but we were too busy with our convention for me to do so. Maybe next time. 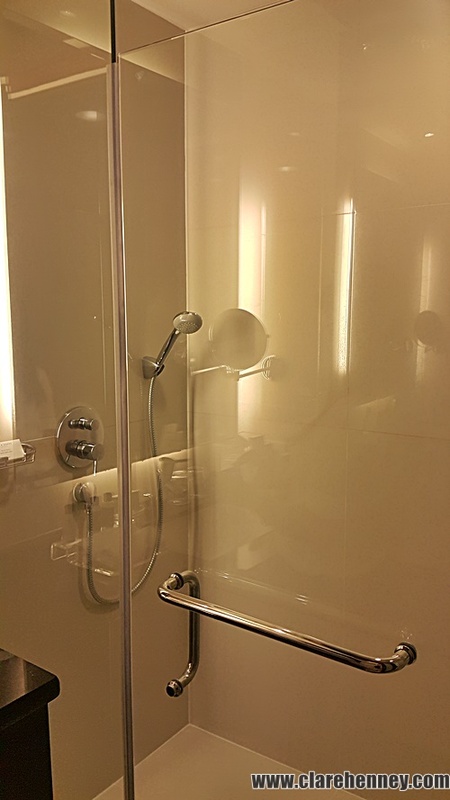 My only comments about the room are about the shower and the toilet: the shower only had a telephone shower – I would have preferred one of those rainfall shower heads considering the kind of hotel I was staying in. 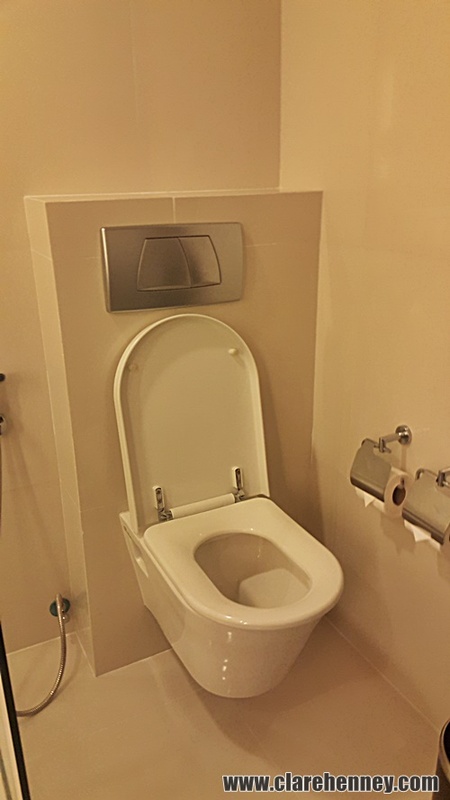 As for the toilet, I think it was a little too high for me (or maybe I’m just a bit too short) that I felt that my feet were dangling whenever I was on it, which was a bit uncomfortable. The bed, on the other hand, was so comfortable that I didn’t want to leave once I was in it. 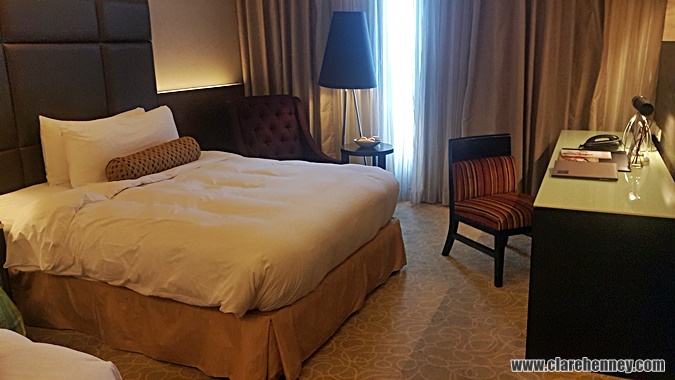 The moment I checked in and sat on the bed I was having second thoughts about going downstairs and attending our event because I just wanted to lie down in bed and get under the equally comfy covers. The pillows were a bit too soft for my taste but once I put one over the other it was all good. It would have been nice if I had extra pillows though because I’m a crazy pillow person when I sleep. Breakfast was free for our booking and we had it at their Phoenix Court restaurant, which is also at the Tower Wing. There was a wide selection to choose from, but I think the selection at their other restaurant at the Main Wing was bigger based on the last time I was there. Still, it was a good meal and I have no complaints. 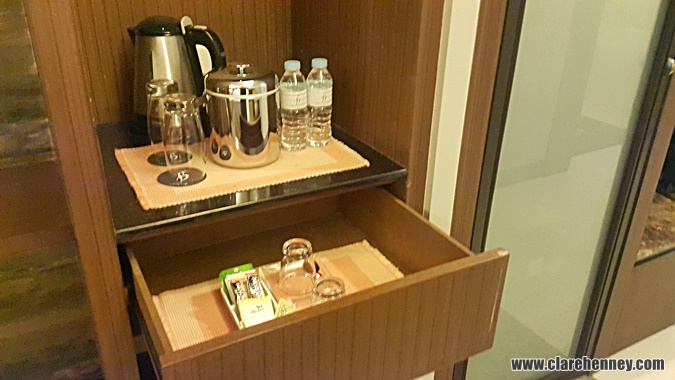 At P4,500.00 for one night, the stay at Bellevue Alabang was worth the money. The room, the food, the very courteous hotel staff made that last stay memorable for me. I wanted to stay longer if I could. I’m hoping that I could bring my family over for a staycation sometime soon because I enjoyed my stay. I've stayed in similarly starred hotels but this hotel is the better one of them. I was supposed to book my family a stay at Bellevue over the holidays but I just couldn't find an available date that would fit my schedule. Maybe sometime next year I can come back and relax there a bit. Bellevue Alabang, I’ll see you again soon (I hope). Stay lovely.